Those who’ve gone hiking with me, at one point or another have heard me joke that I don’t even like hiking. This joke is because hiking and I have always had a love-hate relationship, with literal ups and downs, but when it’s finally over, and the blisters heal, I’m always headed back for more. Recently on a GWH group hike, someone asked me why hiking is one of my favorite hobbies, and at the time I didn’t have an answer, but as we walked and I reflected, I realized that hiking is important because of the lessons it teaches you about yourself and life. 1. Forget the saying “it’s not the destination, it’s the journey.” When you get to the summit, really take it in. In fact whenever you accomplish anything, truly take time to live in that moment. Your moment of accomplishment is just as important as your moments leading up to it, give it the respect it deserves. 2. However, it’s equally important to stop along the way and notice the small things. It’s easy to look out at the views or notice the hikers you pass, but sometimes it’s important to see beyond the blatant things. Maybe it’s the trees rustling in the wind, or the way the rocks are formed along the trail, or a bee buzzing around a plant. Whatever it is, find something small and appreciate it, because while it’s wonderful to be goal focused, if you’re too zoned in, you’re going to miss a lot of life. 3. No matter how long you’ve been hiking, you are never too seasoned to listen to advice. Even when it’s something you already know how to do or use, let the other person tell you anyways. It reaffirms your knowledge and adds to theirs. Life is continual growth and when you approach it that way, you’ll learn more about what you thought you knew than you could ever imagine. 4. When on a group hike, and you’re out of shape and worried your breathing like a water buffalo, you don’t have to warn people that you’re not dying or make excuses about having allergies. They’re not paying attention to you, or your breathing. In fact, they’re probably paying attention to whatever is going on with them, because we often notice our own insecurities before we ever notice the flaws of others. 5. Overpack and carry the damn weight proudly. It’s always okay to carry more so that you’re prepared and pretty dangerous just to wing it. Enough Said. 6. How you speak to others on the trail reflects a lot about your personality, but how you choose to speak to yourself shows true character. If you would not tolerate emotional abuse from others, why would you disrespect yourself in the same manner? Some of the harshest words we use are the ones we use to speak to ourselves with. Be kind to others, be kind to yourself. 7. And more important than talking, learn to listen. Your body talks to you in various forms. Learn to push your boundaries without hurting yourself. Most everything is possible with hard work and dedication, yet it’s when we fail to hear the cues from our bodies that injuries happen. Learn to recognize when your body needs rest, water, electrolytes, a good laugh, or a beer. 8. The internet (including apps) are not always 100% accurate. I didn’t fully believe this one until we were on mile 16 of a quoted 12-mile hike, even though we were following the exact map in the app. It’s important to do your research, so you know what you’re getting into. It’s important to do your research with anything you read on the internet--not just hiking. 9. You’re going to make mistakes, you can either let them define you, or you can learn from them. Learning isn’t just about knowing what to do for the next time; it’s also about forgiving yourself to the point where you can laugh at yourself looking back. My trail buddies like to remind me about the time I read a map upside down (to my defense the app the map was on was handed to me upside down). Try to avoid the big mistakes by preparing, but when the little things happen, learn, laugh, and move on. 10. Last, and most crucial-- water is life. Yet most hikers (and Americans) are constantly dehydrated. So whether you're on a desert trail, a snowy summit, or even just your couch at home, continuously remember to keep drinking it. In fact, grab yourself an icy cold glass right now. Courtney is an Ambassador for our Los Angeles chapter. 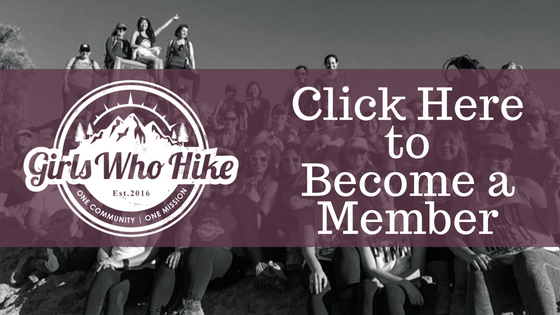 You can join her local meet ups and discussions through Girls Who Hike LA by clicking here.